Each K9 Frisbee Toss & Fetch League Season consists of 5 weeks of Toss & Fetch competition between multiple disc dog Clubs from anywhere in the world in a fun, friendly and competitive league environment. Each Club determines their own day, time and local field location for each five-week League Season. On each Club’s weekly League day and field, all Club Teams (a Handler & a dog) play two (2) rounds of K9 Frisbee Toss & Fetch to establish a Weekly Score for each Team. Scoring is cumulative throughout the five weeks and teams will be ranked in Weekly Standings based on their cumulative weekly scores. Handlers can play with multiple dogs to form multiple Teams (handler & dog), but only ONE (1) Team per handler will score and count towards League Points -- the Team with the highest final point total for any Handler. All teams will be scored and tracked in the Standings. Mulligan Rule: At the end of each five-week League Season, the lowest weekly score (plus any handicap points for that week) will be dropped to establish each Team’s Final Score & Final Standing. The Final Team Standings will determine Final League Points earned for each Club. Teams that Rank in the top 40% of the Final Standings (based on the number of unique handlers) earn League Points for their Club. 1st = 320 points; 2nd = 319 points; 3rd = 318 points; . . . 320th = 1 pt. Tied Teams share points for all placements that tied. Clubs will be ranked based on the number of points their teams accrue with the highest scoring Club declared that League Season Champion. Club Tie Breakers: The Club with the highest placing Team between them wins any tiebreaker. Any ties keep rolling down till broken. This is a sample, partial scoresheet and rankings after all five weeks are played. All Teams from across the League are ranked 1st to last based on their Total League Score which equals (Week 1 + Week 2 + Week 3 + Week 4 + Week 5 + Handicap - Lowest Week). Teams in the top 40% earn Club Points based on their ranking. Toss & Fetch League is open to disc dog clubs, organizations or any groups of 8 or more dog-loving friends, anywhere, who can get together on the same day each week to play two rounds of K9 Frisbee Toss & Fetch. To become part of the League, the following conditions must be met, along with a vetting by the League. A minimum of 8 people (Handlers) of any skill level. A field to play on once a week for 5 weeks. The League charges $10 US for each Team (handler and dog) to cover an entire five week Season. Handlers who play with 1 dog pay $10 , Handlers with 2 dogs pay $20, etc. There is no limit to the number of Teams a Handler can enter. Handlers pay fees to their Club Captains who make their payments by the 3rd Week of each Season. As a way to allow smaller groups of less than 8 to enjoy the fun and excitement of K9 Frisbee Toss & Fetch League, and to hopefully grow into a full-fledged Club one day, come out and play as a “Squad”. To form a Squad, you must have at least four people (4 unique individual humans) on your roster when a season begins. As always, each person (handler) can play with multiple dogs and dogs can be shared amongst multiple handlers to form multiple Teams, but it’s the number of individual people that you count to form a Squad or, if you get to 8 or more people, a Club. · Squad member Teams (human and dog) WILL be ranked in the Overall Standings each week along with all the other Teams in the League. · Squad members will each receive a commemorative, embroidered “Canis Felix” patch and will NOT be eligible for the “Canis Magnus” patch, which is only awarded to teams who score League Points. · A $20 USD up-front Squad Fee will be required, along with a $10 per team fee, paid in advance before the League Season Commences. Squads will play under the League Rules including the requirement that at least 4 handlers are present during League play or that week will be forfeited. Squad to Club:If, in the course of any Season, a Squad grows to 8 or more people by the 3rd Week, that Squad will be promoted to a Club, ranked amongst other Clubs, and Handlers with a Team that finishes in the top 40% of all Teams will be eligible for the “Canis Magnus” patch. Club to Squad:If, after Week 3 scores are submitted, a Club has less than 8 active people on their roster, it will be converted to a Squad for the remainder of that season, will be removed from the Club Rankings and its Handlers will be ineligible for the “Canis Magnus” patch. Promoting, Organizing, Recruiting, Registering, Field Logistics, Judging, Coaching, Submitting Scores, Cheer Leading and Administering the League for their local Club. Captains may appoint Co-Captains, for whom they vouch, to help in any way. A Captain or Co-Captain must be present during League night play. At least 4 Handlers must be present before play can commence each night. Captains need to submit their weekly scores ASAP, ideally within 24 hours, so they can be entered as the week progresses. A spreadsheet will be provided. A website is coming soon. Clubs are comprised of multiple Teams who are ranked agains all the other Teams in all the other Clubs in each League Season. The top 40% of all Teams earn points for their Club. A "Team" is a Handler and a Dog. Handlers may compete with multiple dogs to form multiple Teams. Handlers can play for only 1 Club/Squad in any League Season. Only one dog per Handler can score League Points. When a Handlers plays with more than one dog, the dog with the highest score at the end of the season will be eligible for League Points. All dogs (Teams) will still be ranked. Handlers will register and compete in one of the four Divisions based on their best dog's ability, for the length of each 5-Week League. Junior Handler: Anyone 13-years or under before the League Season begins. Handler I: Any novice or beginning Handler. Handlers who, with their top dog, typically scores less than 20 points in two rounds of play each week. 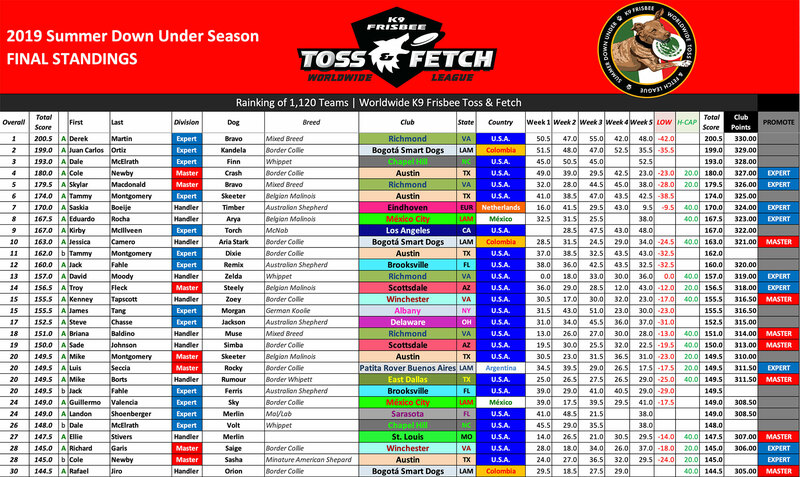 Master Handler II: Handlers who, with their top dog, scores less than 32 points in two round of play each week. Handlers who cannot/no longer complete catches past 40 yards. Expert Handler III: Any Handler who, with their top dog, is capable of scoring 32 points or more in two rounds of play. 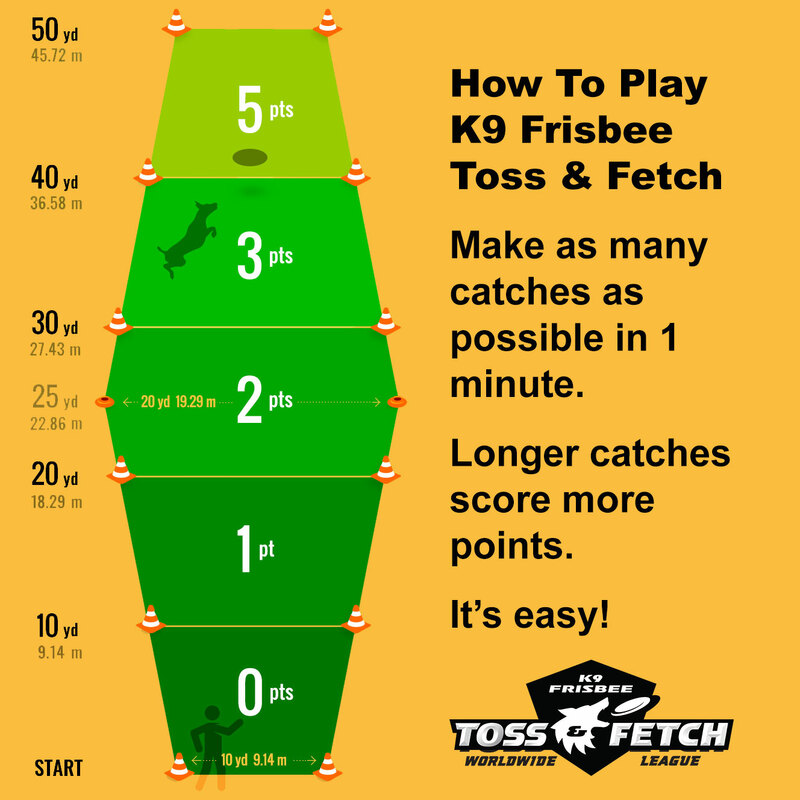 For guidance on setting a handler's division level, refer to the blog post: How To Determine "Division" Rating in K9 Frisbee Toss & Fetch League. NOTE: If a Team misses a Week, they are not awarded handicaps points for that week. League Weeks begin on the Saturday of each Week and end on Thursday so that all scores can be submitted no later than Friday, before the next Week begins. Clubs can schedule their League play any day/evening except Friday so that weekly scores can be entered, tallied and published before the end of each week. NOTE: It is now possible to play weekly rounds on Friday's but requires permission in advance from the League. Friday play would begin the before the season begins, which is always on a Saturday. All of a Club’s Teams must play together once a week, and ONLY once a week, in each of the five league weeks, at the same time, on the same day at the same field. In the event of un-playable weather, a rain make-up night can be scheduled but it must be completed no later than Thursday of each week. Weather is part of the game. Clubs should only re-schedule a rain date if the regular scheduled time is unplayable. Make-Up Weeks for Clubs or individual Team Rounds are not allowed. If a Club or team fails to play in any given Week, they will not be scored for that week. To keep an eye on each other and ensure at least 3 judges are available per round, at least 4 Competing Handlers must be present on each League Night. All Clubs will play on a 50 yard long trapezoidal field divided into 10 yard increments (scoring zones) with 10 yard wide end lines and a 20 yard wide midpoint per the diagram below. Metric conversion is provided in the field diagram. To make set-up fast and easy, striping the field by painting lines is NOT required. Cones are used to mark the dimensions and scoring zones of the field. Since there are no required lines, judging will be by line-of-sight, two (2) side judges and a starting judge are required for each round. The object of K9 Frisbee Toss & Fetch is to complete as many catches as possible, in bounds and within the Scoring Zones in the time allotted. Each Team plays two (2) sixty-second (:60) Toss & Fetch rounds per week. Teams can select either end of the field from which to play each round. However, once a round begins, all throws must be made from the same end of the field. Teams may opt to take only one (1) practice throw with their dog before they begin each round. A Team can switch to a different end of the field after a practice throw, but they don’t get another practice throw from the new end. Any recognized dog-safe disc is allowed, including floppies. Ring discs are not allowed. If in doubt, check with your Club Captain. Lure discs are allowed, however only only one disc, the same disc, can be in play in a given round. If you're playing with a lure disc, try and make sure it's a different color then the disc in play. Before a round begins, handlers may hand the Line Judge a back-up disc in the event a disc in play becomes unplayable. Handlers must hand the unplayable disc to the Line Judge to switch discs. Both Handler & Dog must be completely behind the starting line before time begins. Handlers may cross the starting line after and between each throw, to retrieve a disc, encourage their dog, etc., but they must return to make all throws from behind the starting line. After time begins, dogs can be anywhere on the field and are no longer required to be behind the starting line. We follow “the Line is Your Friend” rules whereby Teams score Points for each successful catch based on where the dog’s trailing paw lands for each catch. A trailing paw on a Zone line earns the higher Zone. At least one paw must land in bounds or on a sideline, otherwise a catch will be out-of-bounds and scored zero. Any catches where all paws are past the 50 yard line will be scored out-of-bounds. Air Bonus: An additional ½ Point Air Bonus is awarded for each leaping, jumping catch, determined by all four paws off the ground at the time, and then landing in a scoring Zone. If a throw is released before the “T” in “time” is announced, a successful catch will be scored. Close calls go to the Team. In an effort to reward success and encourage the little ones, in addition to the standard scoring zones (1, 2, 3 & 5), a catch in the 0 to 10 yard zone or anywhere out-of-bounds, will be awarded 1 Point, provided the throw was a good faith attempt to throw at least 10 yards. The “attempt” clause is added to avoid purposeful, short little tosses to rack up points.